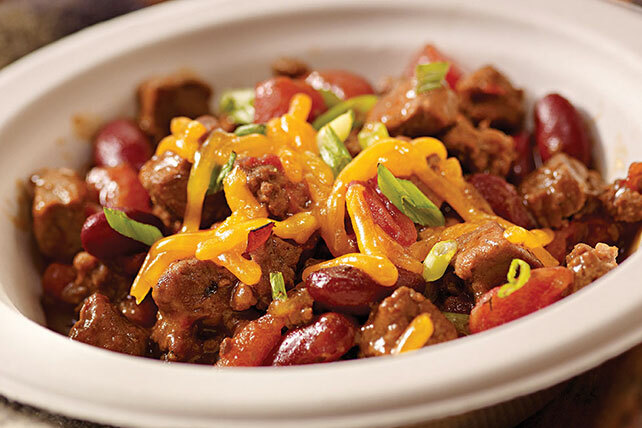 This hearty BBQ Steakhouse Chili is made with tomatoes, beans and a pound each of beef top round steak and extra-lean ground beef. Heat oil in large skillet on medium heat. Add next 5 ingredients; stir. Cook 10 min. or until meat is evenly browned, stirring frequently. Spoon into slow cooker sprayed with cooking spray. Add all remaining ingredients except cheese; stir. Cover with lid. Cook on LOW 7 to 8 hours (or on HIGH 4 to 5 hours). This is a great game-day chili since it both makes enough to feed a crowd, and can be prepared ahead of time. Refrigerate any leftovers, then reheat and serve spooned over split hot baked potatoes or cooked OSCAR MAYER Wieners.